Good morning from sunny, 80 degree Islamorada, Florida, which I first learned means “purple island” but later learned means the “little drinking village in the Florida Keys with a fishing problem”. I had the great good fortune of going fishing (no, I didn’t catch anything except an oversized minnow, aka extremely undersized fish) and also snorkeling (the closest I come to “sport”). The snorkeling is wonderful in the Keys, which is because all the individual reefs here are part of the Great Florida Reef, the third largest coral barrier reef in the world, after Australia and Belize. The reefs are vigorously protected by the State of Florida (1960) and the Federal government (1990). For those of you who, like moi, “forgot”, coral is not a plant, despite the names given to them. Coral is an animal that feeds on algae and plankton, but maybe on little fishes or urchins also, mostly at night. Yes, coral is a NOCTURNAL ANIMAL. Another surprise is that a coral may look like one large organism, but it is actually a large colony of identical attached polyps, each one of which are usually only a few centimeters tall. Each polyp has a mouth, surrounded by tentacles. In between the polyps is calcium carbonate (limestone rock) secreted by the polyps themselves. Amazingly, the polyps reproduce by spawning (yes, sperm fertilizing eggs) during a full moon. In August. (Once in a while, July). This phenomenon bears repeating: their reproduction is HIGHLY SYNCHRONIZED TO A FULL MOON IN AUGUST. This makes me reconsider what I thought was mythology; in other words, I should buy a copy of The Farmer’s Almanac and start planting my vegetables in tune with the moon. If coral knows to do this to assure success, we should too, n’est-ce pas? Plants are often raised in nurseries, and so are animals, including corals. 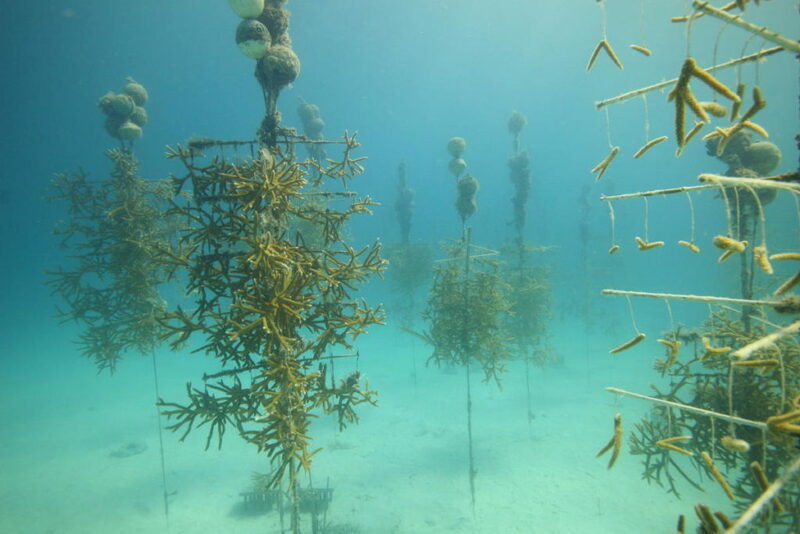 Beginning in 2003, the Coral Restoration Foundation [CRF] began to take “cuttings” of live elkhorn and staghorn coral, created ocean-floor nurseries of these “mother” segments, and are now raising thousands of new corals. When large enough, volunteer scuba divers “transplant” the corals back onto reefs. So far, the experiment is working. The corals are growing in their new homes. 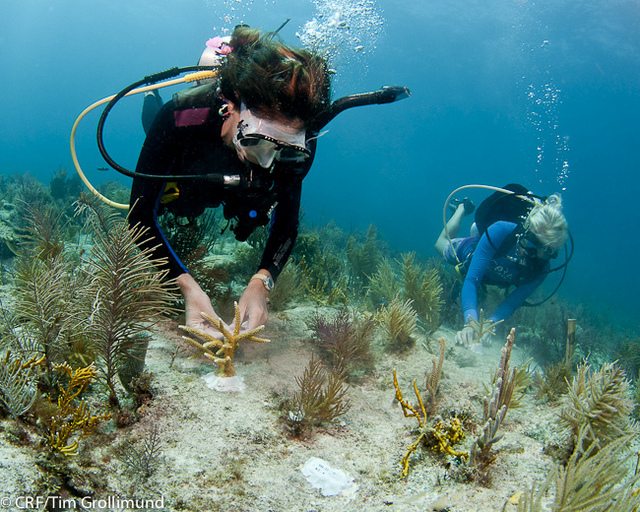 Nonetheless, the restoration hopes of the CRF are big: 98% of the elkhorn and staghorn coral have died in the Keys in just the past 20 years. One reason for this death is that coral appears to have, ahem, an eating disorder, cause unknown but culprits include warmer seawater or yes, even sporadic very cold water temperatures. When this happens, according to the National Oceanic and Atmospheric Administration, all the corals expel a particular microscopic algae that live in their system. This event removes the green/brown chlorophyll color contributed by the algae and turns the coral a dark white. While the coral may not die from one event, the animal becomes stressed and vulnerable. This “bleaching” phenomenon is a natural occurrence, but was seen for the first time on a massive scale in 1973, when it snowed in the Keys. Oceanographers may be spending time worrying about the effect of warmer/colder water and climate change, but I’m even more cynical about human interference with ecology. As a former regional planner, I wondered about a different culprit, especially after a CRF scientist mentioned to me that the degraded reefs are usually covered in too much algae. What have humans created that would cause too much nitrogen? Either fertilizer run-off or sewage, right? One Google search, and it was easy to find articles about Keys’ beaches closing in 1999 because of e.coli outbreaks. Soon thereafter, a Comprehensive Plan was written that decreed that by 2010 all Keys’ towns had to eliminate septic systems. From the look of the sewer pipes being placed along Route 1, it appears that the project is taking longer. Nonetheless, the captain of my snorkeling boat yesterday told me that he can already notice how much more clear the water is than 10 years ago when he moved here. Wonderful! Used to be great snorkeling off Long Key State Park too! Oh My! I have just learned more than I thought I would when I started reading—“One Response”………all very interesting!!! We need to save Coral Reefs everywhere in the World for sure!!!! p/s Rommy, you are such a great writer and I feel like I learned something from your “blog”! Thanking God for those working on growing and transplanting coral!??! I’d been wondering what could be done! Great story!